Although it doesn't really feel like it, Spring has been in and out for just over a month because, despite what people think, Spring really does bring with it a lot of rain and miserable weather. Obviously, as the season changes, the skincare that we use changes but, for me, these skincare favourites seem to have carried on through to Spring from Winter. When products can do that, it's just something special. I was sent this product quite a long time ago now and since the day I tried it, I have continued to adore it. I had absolutely no clue that I would fall so in love with an oil for my face - to me, the thought of it is rather bizarre and when my family or friends see me use, they're equally as confused. Even though I am someone who generally suffers from dry skin, I do also experience oily zones; despite this, applying this Rosehip Oil to my face doesn't make my skin over greasy. It soaks in quickly and can, rather surprisingly, substitute my moisturiser altogether. And, as you can probably imagine, the Rosehip scent is so comforting and feels very luxurious. I've only had this little product for a few weeks after lusting over it for a while. If you don't know what the Drying Lotion is, it is basically a very intelligent little spot-buster. Using a cotton bud, I dip one end into the pink chalk solution at the bottom of the jar then gently dap it on any spots or blemishes I have. As I said previously, I do suffer from dry skin, however, every now and again, I am surprised with one of those angry, aching spots that seem to take around 2 weeks to show signs of disappearance. As well as this, I hold my hands up in confession as a spot-popper. I know, I know, it's terrible so I purchased this product in the hopes to change that habit. So, I'm currently waiting for a big angry spot to crop up but in the meantime, I am using this on small, under-the-skin zits and genuinely seeing a real difference. Let me know if you'd like another update on this product in a few months time. I received this hand cream as part of a gift set at Christmas but I really didn't expect to like it as much as I do. As much as I enjoy them, hand creams typically all do the same job and the only differences between many of them is the thickness and scent. 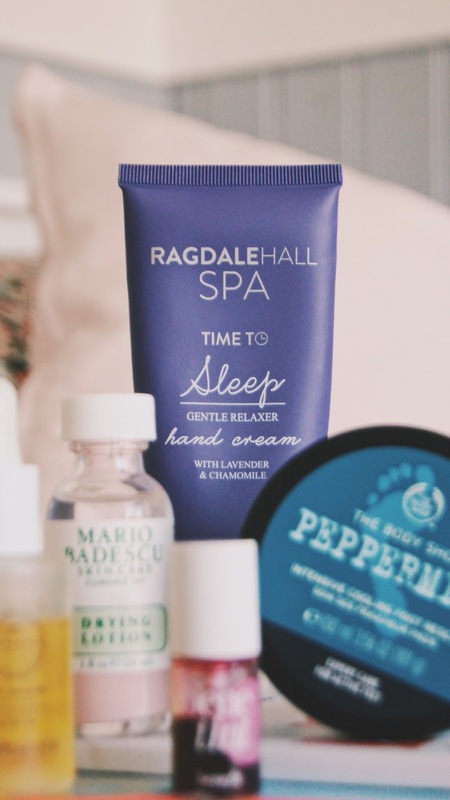 I usually enjoy the Crabtree & Evelyn Hand creams because of their consistency and powerful scents but when I started using this Ragdale Hall hand cream, I realised that for almost a quarter of the price, there's still some good stuff out there. This Lavender and Chamomile moisturiser has some serious magic powers when it comes to bedtime. I don't know if it's psychological but it genuinely helps me fall asleep after 5 minutes of applying it to my hands - it's really brilliant. 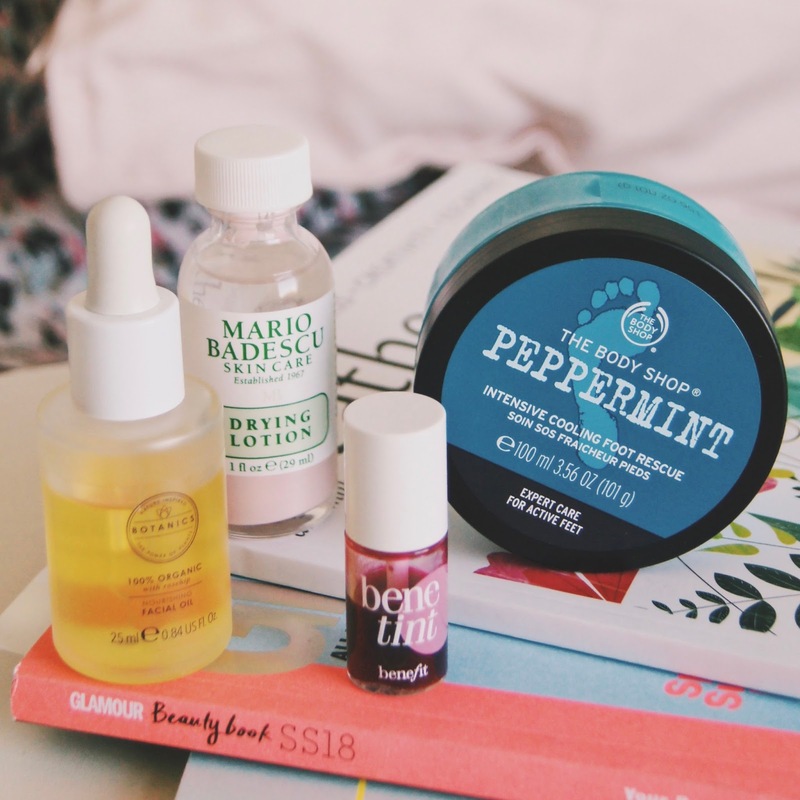 The Peppermint Foot Cream from The Body Shop is a product that I've mentioned here on the blog before and it's back because, after 3 years, I have rekindled my love for this foot cream. The tub in the images is actually my second tub because with a holiday on the cards within a matter of weeks, I really want to look after my feet before I end up battering them with sandy beaches. As well as this, I do have quite dry, hard feet that do need an effective foot cream (as opposed to an everyday moisturiser) so this one works wonders with its grape extract for softening the skin and peppermint oil for cooling the skin. This tiny little gem has been in my makeup bag for a pretty long time because I really love it. I am totally obsessed with lip stains - they're my favourite type of lip product mainly because of how long they stay on the lips and how low maintenance they are. These are perfect for anyone working in retail or customer service based jobs because you don't have to worry about your appearance weakening throughout the day as your trusty lip-tint will just continue to shine. What's so wonderful about the Bentint is how it will last on your lips all day, but then not cause a problem when you come to take your makeup off. I also find that, after applying the lip tint, it's sometimes nice to apply a coloured lip balm over it to make up my own shade suited to me. If you know me, you know that I love and preach Soap & Glory make up. So many of their products have worked their way into my collection and, although there are a few that I wouldn't recommend, I do seem to sit well with a very good handful. One of them is the Archery Brow collection; I started with the 'Archery Brow Tint and Precision Pencil' a few years back (which is a tiny brush with tint, and a thin pencil at the other end) but eventually, I was overcome with the desire to try brow gel. The 'Sculpting Crayon and Gel' differs from the original as it has an angled crayon for filling in the brow shape, then a slightly tinted gel for putting the brows in place. And, boy, is that gel strong. Admittedly it can apply a bit heavy sometimes and will need wiping away to avoid having me look like plastic, but otherwise, it really does give me that confidence that my brows will stay in place all day. For someone like me who has fair eyebrows that need that bit of attention, this product is brilliant - especially for on the go. Which Skincare and Beauty products have you been loving lately? Oh I'm a spot popper too, I'm one of those sick people who really get a kick out of bursting a juicy one haha! The facial oil sounds amazing, I've never used a facial oil before. 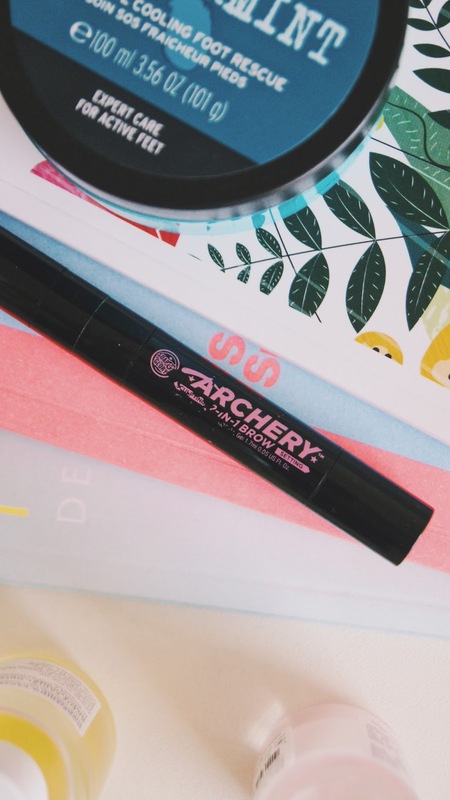 I've recently started using a Soap & Glory Archery brow pencil which I love so definitely want to try more of the range. I really struggle with colours being a binge but this is perfect. oh i love Botanics Facial Oil. I love my Glossier moisturiser right now a lot. I've been using that drying lotion for years and it's basically one of the only products that I've consistently kept using- I love it! I really wanted to give the Mario product a try. it looks fun to use and I have heard a lot of things about it! let me know If a spot comes up where you can use this product!